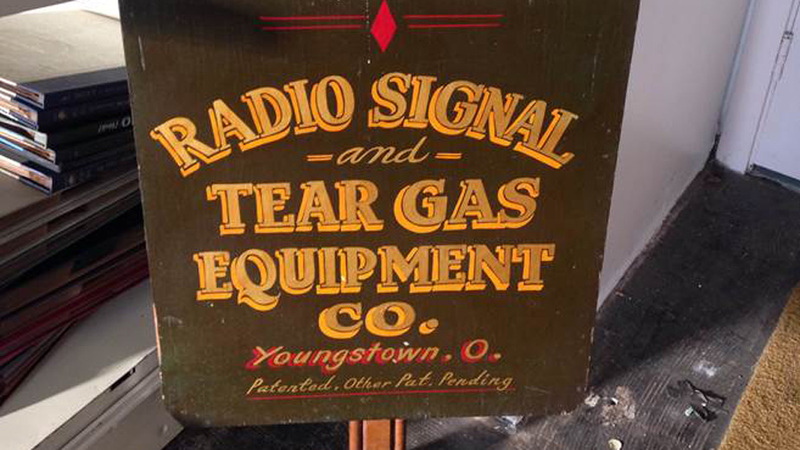 YOUNGSTOWN, Ohio – Harry Hofmeister made one of the more extraordinary finds in his 15-year career as an auctioneer as he went through a house he was preparing for auction. Coming upon a closet, the auctioneer and broker at Hofmeister Realty & Auction Co., Salem, recalls that he opened its door to find a woman’s prosthetic leg – not the kind of item one expects to come across – and called his client, who had moved out of the state. New prosthetic limbs can cost in the thousands of dollars, if not tens of thousands, but the artificial leg sold for just $8 at auction. “I’m surprised anybody wanted it,” Hofmeister says. Because the limbs are fitted to the individual, “you can only use them for one person,” he says. The leg is just one of several unusual items Hofmeister and other local auctioneers have come across over the years. Hofmeister recalls coming across a charcoal pencil drawing of a farm while conducting an auction in Salem. The owner’s wife told him that her husband tried to give it away once but nobody wanted it. A “great hush” came over the crowd as the item came up for auction, and the bidding rose from the $50 initial price to the winning bid of $16,000, he recalls. The pencil drawing was by famed artist Ferdinand Brader, who had done several of his detailed sketches of farms in Ohio and Pennsylvania. “There were several dealers there that were pretty excited about it,” Hofmeister says. Since then, he has sold several other Brader prints, always advertising they would be among the items offered at the auctions. 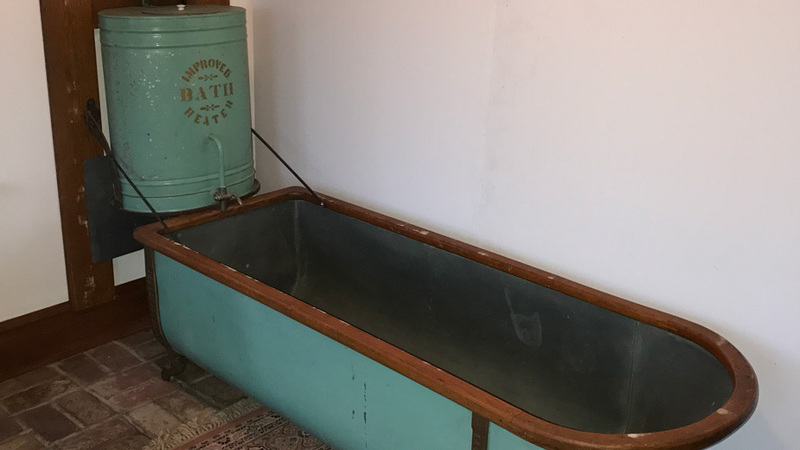 Last year, Paul Basinger, owner of Basinger Auction Service in North Lima, sold a pair of fold-up bathtubs from a house on Canfield Road. The metal tubs, which debuted at the 1893 World’s Fair and came in several styles, used kerosene heaters to heat the water. Pictured: Paul Basinger has sold fold-up tubs for about $3,200. Basinger’s client had purchased the two tubs in Middlefield about 15 years ago. “The Amish use those,” Basinger says. Basinger advertised the tubs online and in AntiqueWeek, a newspaper that focuses on auction, antique and collectibles news. Both eventually sold for $3,200 a piece, plus 13% buyer’s premium, to a buyer in Texas. Other unusual items Basinger has handled are a mounted bison that sold for $1,000 and a coffin cover with a glass viewing portal for calling hours that sold for $250. “They would save that cover and put it on the next coffin,” he says. One of the more unusual items Ken Baer, auctioneer and real estate broker with Baer Auctioneers Realty in Rogers, recalls selling in recent years was a horse-drawn hearse. The hearse was part of a collection of more than a dozen horse-drawn vehicles. “He also had tools for buggies,” including tools for making the wheels, “so there were some unusual pieces you don’t see every day,” he says. Jeff Byce, auctioneer and broker with Byce Auction in Youngstown, came across one of the more unusual items he has encountered about three years ago when his firm was contracted to liquidate the contents of the Harmony Bar on Albert Street. Among the items was a holdup protection system used more than 100 years ago. Pictured: Jeff Byce found this intact protection system in Harmony Bar. The system was mounted to the front of the teller’s cage at the bar, where steelworkers often went to cash their paychecks. When the device was discovered at the bar, a tear gas vial was still installed on it, requiring a call to the Youngstown Fire Department to destroy it, Byce says. “It was classified as a chemical weapon,” he notes. The device brought about $500, which he acknowledges was less than he anticipated. Another unusual item Byce came across was a Civil War-era knapsack. Discovered in the attic of a third-generation family house in Girard, the knapsack had markings connecting it to the battle at Vicksburg, Mississippi. That Civil War artifact sold for more than $3,000 online. The sale of the fold-up tub was “just one of the indicators of online internet bidding,” Basinger says. Very few auctions are live today, other than those for nonprofit benefits, he reports. Recently, he sold a pickup truck – a 2004 Chevrolet quad cab with a diesel engine and 46,000 miles – to a customer in Idaho for $24,000. “A new truck today would be in the $70,000 range,” he says. One change in the industry Hofmeister sees is fewer collectibles coming on the market and lower interest in them.